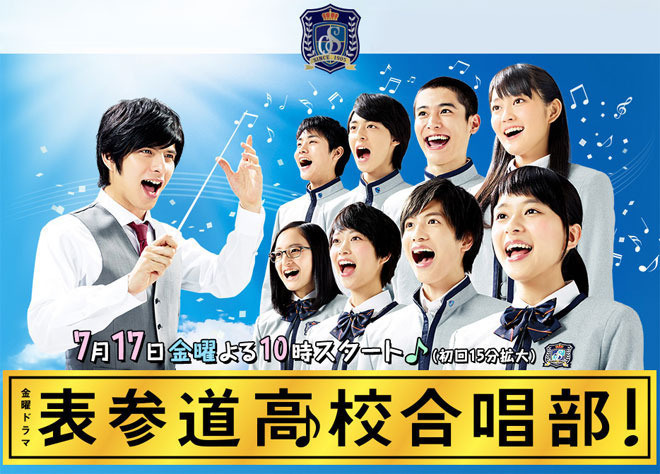 AKA: Omotesando High School Choir! Cast: Shirota Yuu, Yoshine Kyoko, Shison Jun, Yoshimoto Miyu, Mirokawa Aoi and Takahata Atsuko. After her parents’ separation Kagawa Makoto (Yoshine Kyoko) decides to live with her mother in Tokyo. Her father and younger sister stay in Seto Island. As a huge fan of choir singing and growing up with parents who always did choir signing, Makoto decides to join Omotesando High Shcool - the place where her parents first started singing choir and also where they fell in love. Her goal is to reunite her parents by finding the famous 'love song' which makes you reminiscent of your past love. But the only problem is that the current choir club on the school only has 4 members and has 0 motivation in singing. Since the club lacks member, they must have at least 8, it is on the verge of closure, and the club advisor Suzuki Ariake (Shirota Yu), whom Makoto knew from when she was younger and whom she admires, is no help either as he is too busy with hostesses. So Makoto decides to rebuild the choir and save it from abolishment, as well as save her parents' crumbling marriage. Can she do it? I was quite glad that it wasn’t just about her saving the choir club nor it only being about her fixing her parents’ ruined marriage – kind of nice mixing both and getting a bit from both. So all in all, I enjoyed this typical yet refreshing Japanese school drama.